The world has been a stage for Polly ever since she was old enough to decide to wear nothing but leotards and tutus and dance around her family’s apple farm. Not much has changed except the stages have gotten bigger, the costumes more elaborate, and the performances more intricate and daring. Polly began creating dance opportunities for herself in her small town from a very young age. She started a dance team at her school, traveled for hip hop and salsa classes, and performed every year in the local variety show. While attending college at Stanford University she minored in dance, joined the Ballroom team and the Salseros, and studied styles from all over Latin America and Africa. 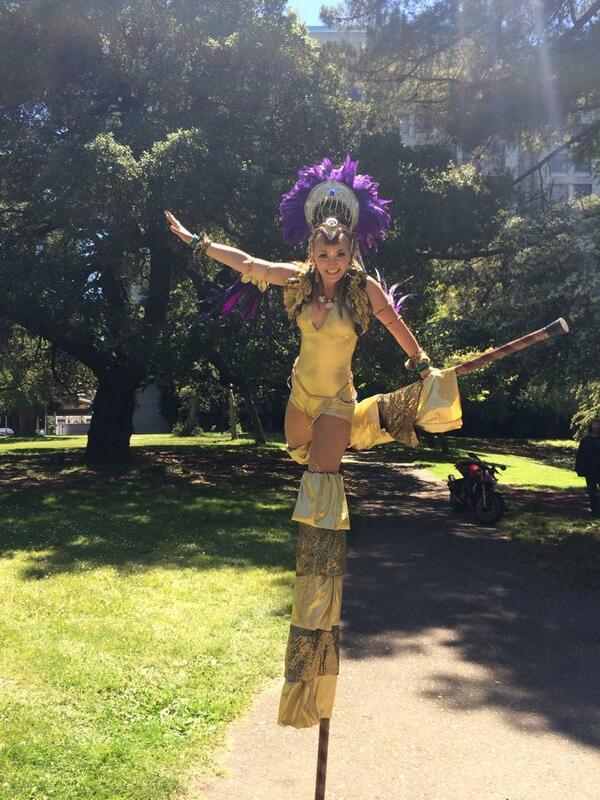 Polly fell in love with Samba and Afro-Brazilian dance while traveling in Brazil, and after learning to walk on stilts she began performing with Samba Stilt Circus of Santa Cruz and Sambafunk of Oakland. She later took her dancing to higher heights, learning and eventually teaching Aerial Silks through Circus MECCA. All of this opened many doors for her and she recently spent 3 years based in Portland and touring the country with the MarchFourth band as an acrobat/stiltwalker/dancer/aerialist//artistic director. In 2015 she decided to take a break from the road and return to the Bay Area where she performs with D.A.M, Samba Conmigo, and Catalyst Arts and teaches stilt dance with Loco Bloco and at the Culture Jam youth camp in Oregon. She has traveled, studied, and performed in Cuba and Brazil and in 2016 she began participating anually in Trinidad Carnaval alongside the traditional Moko Jumbie Stilt walkers. Polly feels most at home on stage and she is excited to continue her long-time dream of curating, teaching, and collaborating with other artists through D.A.M! She is now a NASM Certified personal trainer and group fitness instructor and is available for sessions around the bay area! Visit our fitness page for more info. Visit her Blog or listen to her interview on the Chasing Adventure with Harry Podcast to learn more about her travels and adventures! Polly Pepper performs stilt dance choreography with Mango and Dango and the Flying Umbrella Ship at Grapefest 2017 in Grapevine TX. A tribute to Jon Horvath of Fort Knox Five. Performed at the 2015 Mendocino One World Fest to their song Cinco to the Brinco. A Circus MECCA Production. MarchFourth! dancers perform stilt acrobatics at Sierra Nevada Beer Camp in San Diego, CA. Multiple partner Stilt Acrobatics performed by the March Fourth Dancers in Redding, CA. Choreographed by Polly Pepper to the song Sin Camiseta by Katie Presley. Polly Pepper and Aaron Lyon perform a stilt-pole routine with Marchfourth! Polly Pepper performs a stilt chair dance with MarchFourth! to Rose City Strut at the Crystal Ballroom.